" Sixteen-year-old Katla has just moved from Los Angeles to the sticks of Minnesota. As if it weren’t enough that her trendy fashion sense draws stares, she learns to her horror that she’s a member of an ancient order of women who decide to whom certain babies will be born. Add to that Wade, the arrogant football star whom Katla regrettably fooled around with, and Jack, a gorgeous farm boy who initially seems to hate her. Soon Katla is having freaky dreams about a crying infant and learns that, as children, she and Jack shared a near-fatal, possibly mystical experience. Can Katla survive this major life makeover and find a dress for the homecoming dance? Drawing from Norse mythology and inspired by The Snow Queen by Hans Christian Andersen, debut author Wendy Delsol conceives an irreverent, highly entertaining novel about embracing change and the (baby) bumps along the way." Wendy Delsol made her debut as an author with "Stork" this month, and the book has already been nominated for "Best Fiction for Young Adult" by Yalsa. She wrote the draft for "Stork" in only five months. The book incorporates Norse mythology, and is the first in a planned trilogy. The second book, Frost, is coming out in September 2011. Katla does not appreciate that she has to move to Minnesota after her parent's divorce. She longs for sunny L.A, but soon her mind gets preoccupied by something else: She meets the ladies in the Icelandic Stork Society, an order were the members decide who gets pregnant with a specific child. Katla is overwhelmed by the fact that she is their youngest member, and soon her abilities starts to show. She also meets Jack, and he knows something crucial about Katla's past. Katla is a name I associate with the dragon in Astrid Lindgren's "The Brothers Lionheart". That said, I think it is cool that the author uses this name for the main protagonist in Stork. Katla is a name that holds a lot of strength. It is also the name of the biggest volcano in Iceland. In this story Katla is a sixteen year old girl, originally from Los Angeles but now living in Minnesota. She is interested in design and designer clothes, but she is not a shallow girl. She has a lot of layers, is thoughtful and funny. And I liked her even more as the story progressed. I adored this book. It read like a fairytale to me. Wendy Delsol has created an atmosphere in this book, that spoke to me. I loved the book now, and I would have loved it if I read it during my childhood. This is a book I am going to read to my kids someday. When my mom grew up, she was lead to believe that children were delivered to their parents by the stork. I also heard this myth when I was a young girl - it is something every Norwegian child has heard at one time. (We even have the stork has a symbol of our leading chocolate factory). I think it is great to actually read a book that takes this myth to a whole new level. I also loved the fact that the author has used a lot of icelandic names and titles like "Fru" ( translates as Mrs, we actually use this term in Norwegian), "Hulda" , Gudrun etc. It made me feel more close to the story. Here in Norway we have shared a lot of history with Iceland, and our languages has a lot of similar words and expressions. I really hope a Norwegian publisher buy the rights for this book, I think it would appeal to the Norwegian audience. I also think is is so cool that the author named Katla's new town "Norse Falls". The book is full of mystery, the more I learn about the Stork Society, about Katla and Jack, the more I want to know. Why does Katla hate the cold as much as she do? What is the significance of the birds that seem to protect Katla. I just wanted to read and read. I could have written so much about this book, but you really have to read it to see how great it is. It stands out from a lot of the books published in the YA - genre today. It has something classical about it. I can't wait for the sequel, "Frost", to come out. 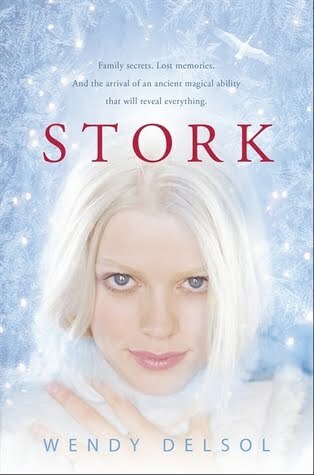 Stork is original and well written, a marvelous debutnovel by an author I am eager to read more from. Candlewick Press has also done a great job with the cover for the book. It is truly beauiful!